Building infrastructure for Windows, SQL Server or SharePoint is not an easy task. It involves dozens of files to be downloaded, several dozens of configurations, several virtual machines, and hours of work. Wouldn’t it be great just to run a few commands, and end-to-end setup happens automatically? With the recent patches, updates and minimal configurations? And the ability to execute your scripts on top? And also run this on Windows/MacOS, and under CI/CD pipelines? Making a disposable domain controller in 20 minutes! There is no manual steps, wizards or screenshots. We value your time offering a scalable and highly repeatable solution for your team or the whole company. This post shows how you can create a disposable Windows 2016 domain controller in 20 minutes with no manual interventions. There is no manual steps, wizards or screenshots. We value your time and offer a scalable solution for your team or the whole company — this is a fully automated and hence scalable Packer/Vagrant workflow which can be run on Windows/MacOS laptops, on Windows 2008, 2012, 2016, in the cloud, share with the team or integrate into CI/CD pipelines. With the increasing complexity of the infrastructure builds and software engineering, the right tooling and automation is a crucial contributor to the overall project success. Automation and tooling can save hours of work, lower down internal cost, help to deliver more features, and maybe most important — improve the team's moral and happiness. When it comes to baking virtual machine images and managing Virtual machines, there might be no better tool than HashiCorp’s Packer and Vagrant by HashiCorp. 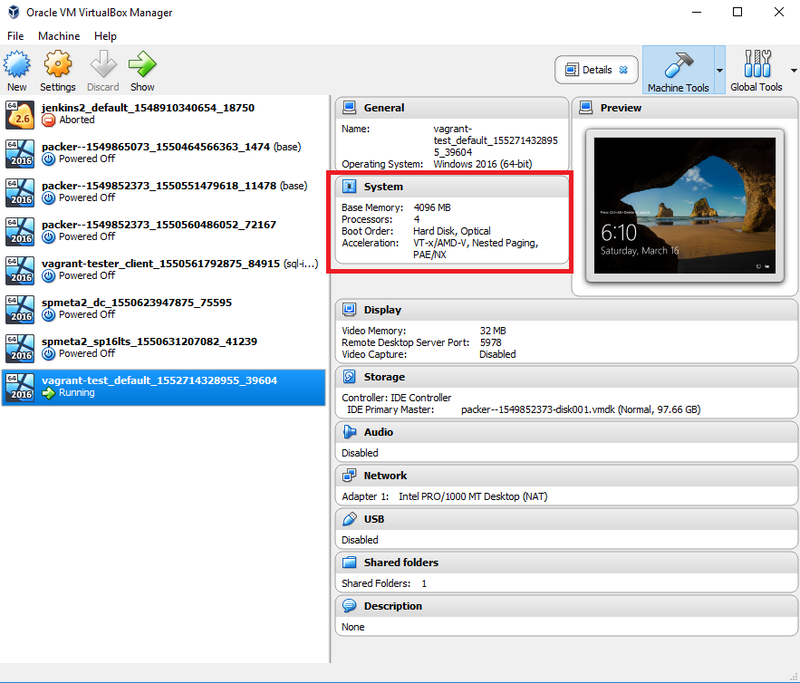 In a nutshell, Packer provides an easy way to create any type of machine images, including Sysprep-ed Windows images for Hyper-V, VirtualBox, Azure, Amazon and many others. Altogether, Packer/Vagrant reduce the complexity of dealing with low-level details of virtual machine image builds, creating and configuring virtual machines and other useless tasks. In return, we have more time to work on features rather than fighting boring and never-ending issues. In more details, we described how’s and why’s we use Packer/Vagrant in the Uplift project in the previous post. Feel free to park it for later read. With Chocolatey, we write a quick recap on how it can be used. Simply run the following and enjoy the result. You might also be asked to reboot. 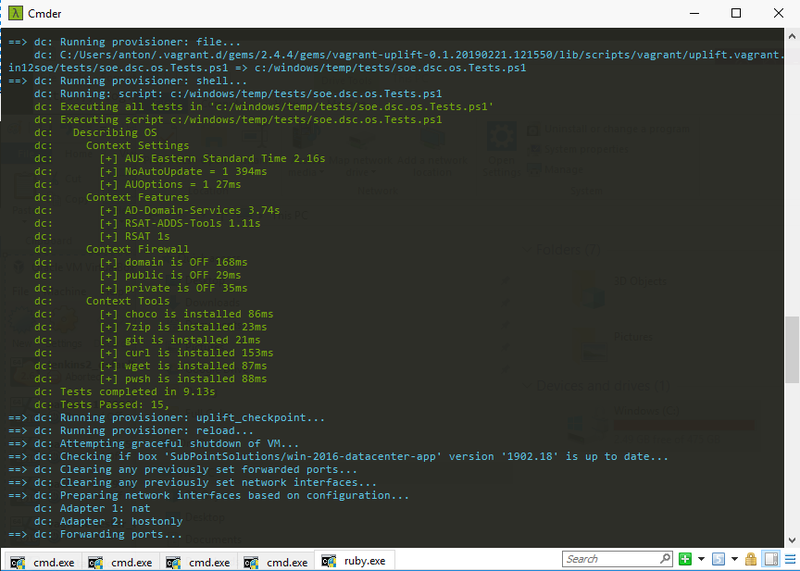 With manual installation, Vagrant comes as a standard windows package asking for a few “Next” clicks. By default, Vagrant comes with VirtualBox. That makes it easier to run virtualized environment on various platforms including Windows 2008, Windows 10, Windows 2016 and MacOS. There is a decent level of automation support for VirtualBox, and therefore we choose to use it. Be aware that for Windows platform you might have to disable Hyper-V in order to make VirtualBox work. This is an unfortunate compromise, Hyper-V or VMware support in the Uplift project might come later. Give us a shout if you need one. A good thing about Vagrant is that virtual machine images can be shared on the so-called Vagrant Cloud. 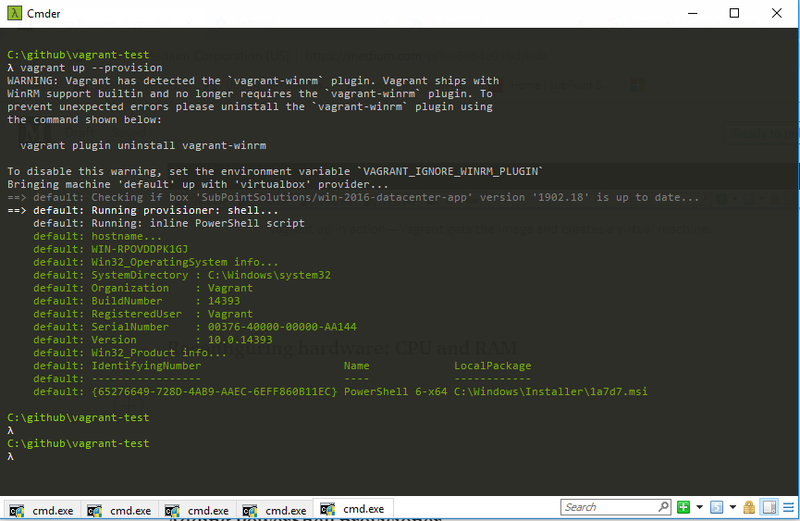 See Vagrant Cloud as a NuGet or PowerShell Gallery but for virtual machine images. How cool is this, really? Variant Cloud contains thousands of ready-to-use virtual machine images. Linux, MacOS, Windows, you name it! We highly suggest to explore it but a few notable images are these. Let us know which your favourite ones are. There is also a bunch of Linux based images, such as CentOS, Ubuntu, Barge and others. There are some with Jenkins CI/CD server pre-installed! At this point, we should have vagrant installed and be familiar with vagrant Cloud. Pick up an image or use Bargee (because it is super-small) or early mentioned images to get started. Once done, you should have a Vagrantfile within this folder. Now we can run Vagrant commands to create and manage the virtual machine. Create a new machine and check out your VirtualBox, you’ll see VM there. 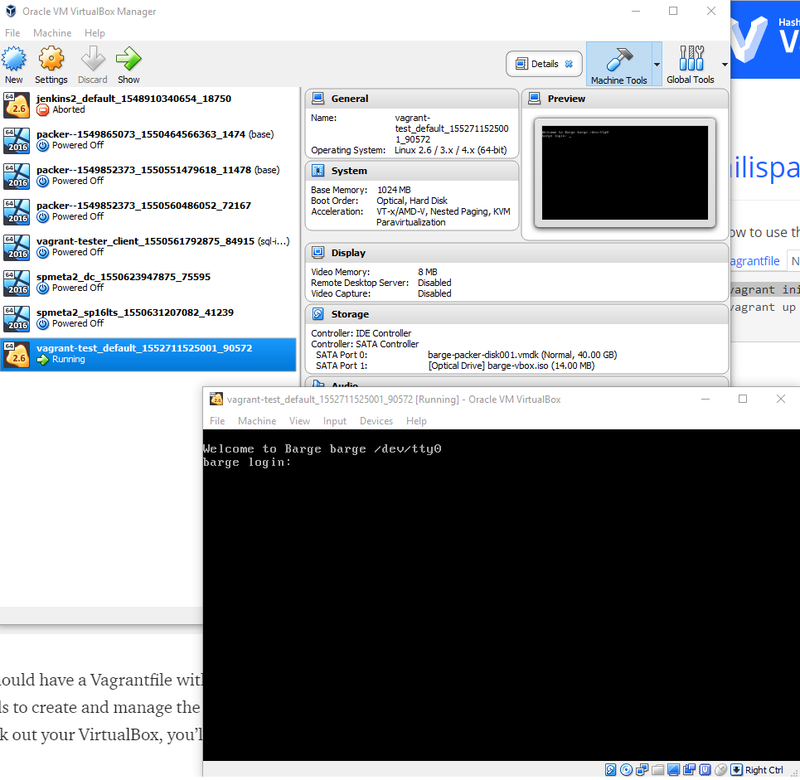 Check out your VirtualBox, here is the virtual machine Vagrant created. As you can see, Vagrant makes virtual machine management super-easy. Give it a go with different images and explore Vagrant further. Usually, Vagrant boxes come with the default user vagrant name and password vagrant. This is a responsibility of the authors while creating boxes, it should come with the vagrant user to enable Vagrant interaction with the VM. Well done! With such knowledge, you should already have some big ideas! Let’s keep moving and see how we can turn virtual machines into something meaningful. At this point, we already know how to find needed virtual machine image on Vagrant Cloud and how to create and manage new virtual machines. Time to learn how we can apply PowerShell scripts against newly created virtual machines. Vagrant provides an easy way to execute scripts, apply Puppet, Ansible and other configuration management systems against virtual machines. This is how the provisioning workflow can be automated and codified via Vagrantfile. 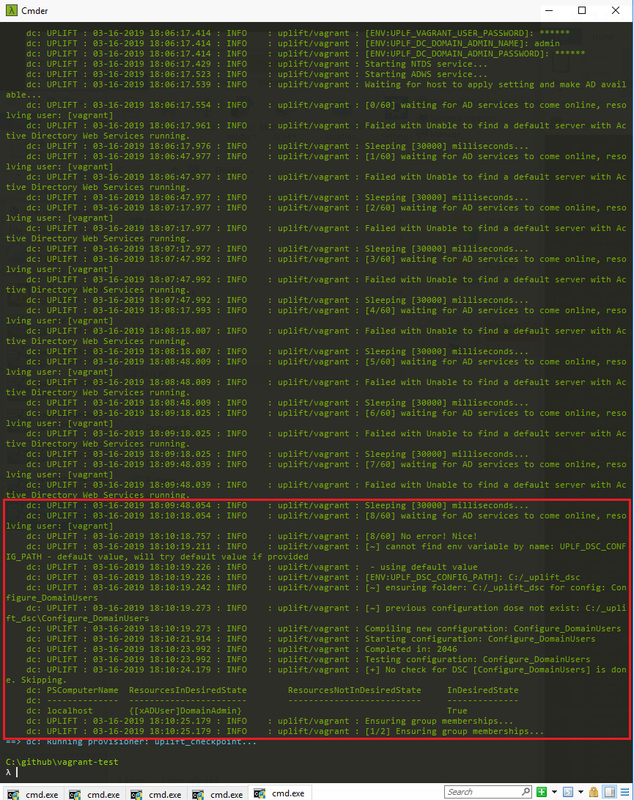 Once done, execute vagrant up to ensure all things work. You should have a working Windows Server 2016.
vagrant up in action — Vagrant gets the image and creates a virtual machine. This is a quick and dirty way to add scripts into Vagrantfile itself. Good for testing and fast prototyping but might not fit advanced scenarios. Once done, execute vagrant up with provision flag. By default, all vagrant provisioners are run once during the virtual machine lifecycle. provision flag tells Vagrant to enforce provisioners against the already provisioned virtual machine. The output should look like this. Pretty cool, huh? At this stage, you should already see how Vagrant makes the whole provisioning process automated and highly enjoyable. 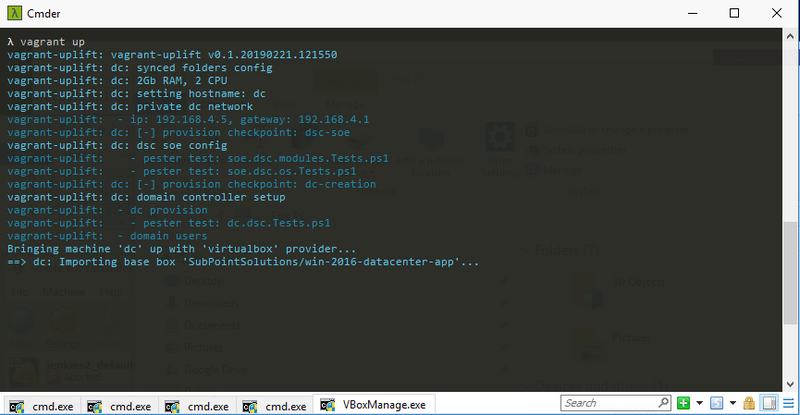 With Shell provisioner, you can execute PowerShell scripts against virtual machines with little to no effort! The next step is to decouple the PowerShell script from the Vagrantfile itself. Provisioner can use the file path to pick up the right PowerShell script so that you can manage and develop PowerShell in the external file. Vagrant configuration for this provisioners becomes trivial. Now you can develop scripts separately from Vagrantfile! Check out VirtualBox, the outcome is now 4Gb with 4 CPU. No manual intervention is needed. Not only you already learn Vagrant, can quickly create virtual machines and apply PowerShell scripts against them, but now you have all the knowledge to move to bigger things — you own ideas or our ready-to-use automation. This is how we can create a new virtual machine and turn it into a domain controller really quickly. At this point, you should already have “SubPointSolutions/win-2016-datacenter-app” box downloaded but if you don’t just review the previous paragraph on PowerShell scripts. Let’s get the second bit, the Vagrant plugin and see what it offers. 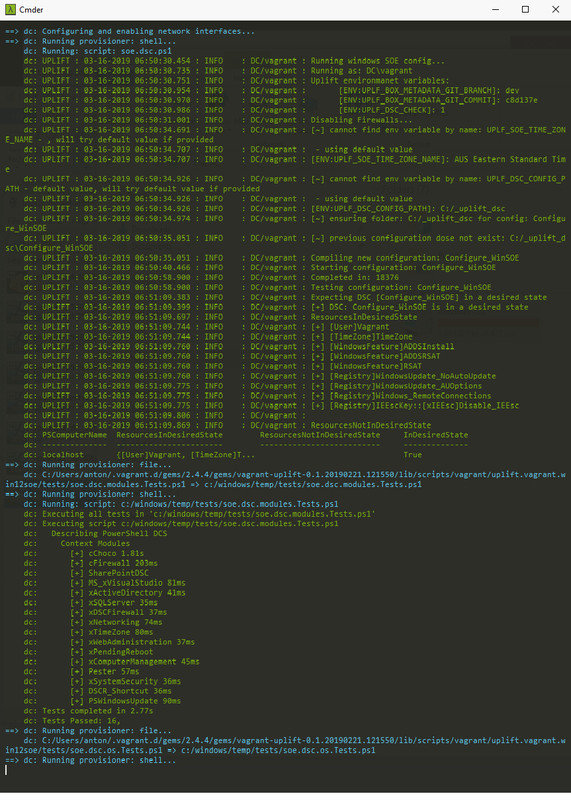 You should be already familiar with Vagrantfile configurations but if you don’t just review the previous paragraphs. 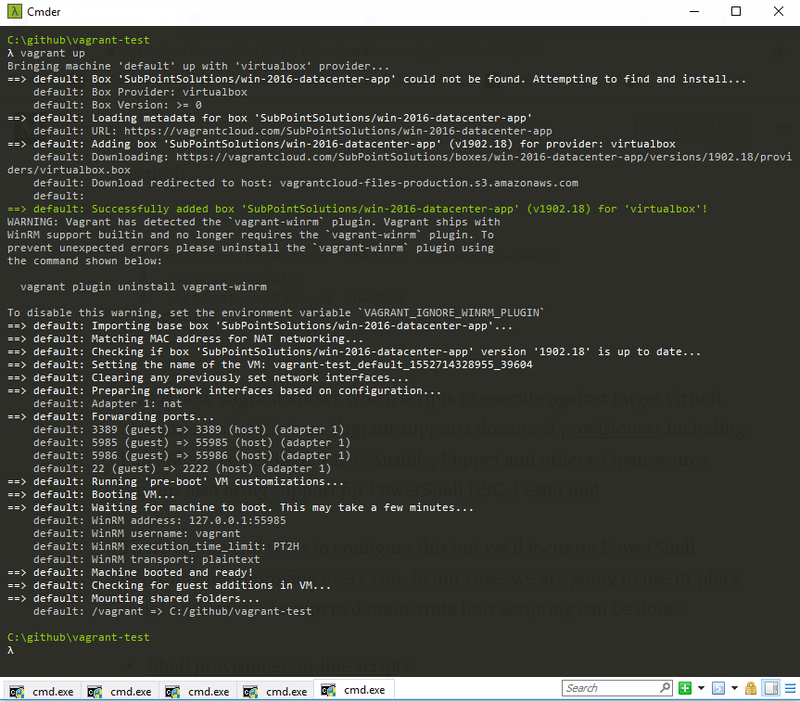 Time to configure a new domain controller with the help of the vagrant-uplift plugin. 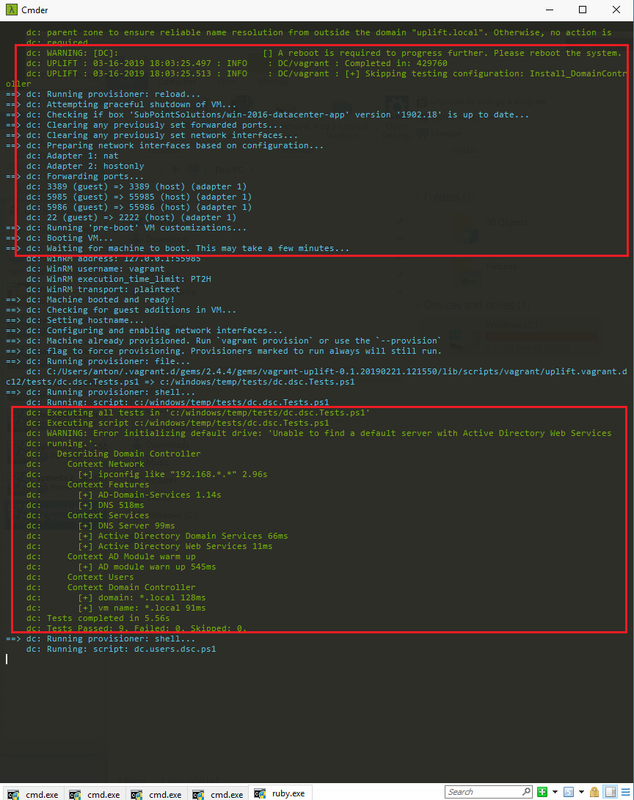 vagrant up; with the uplift-vagrant plugin. Later on, you can see initial provisioning done, then PowerShell DSC configuration for the domain controller gets executed, and then reboot completes domain controller. All steps come as a Vagrant helper; both provision and Pester execution is written in PowerShell and PowerShell DSC behind the scenes. Here is how vagrant-uplift plugin configures basic settings and executes Pester tests at the end — we ensure that needed windows features are turned on, registry settings present and so on. This ensures high quality and consistency of every setup. Finally, the domain controller provision kicks in. Once done, the virtual machine gets rebooted and we execute another set of Pester tests to ensure that the domain controller was setup correctly. Well done! At this point, you have your domain controller done for you. Check out VirtualBox and use default vagrant user with vagrant password to get into and explore what’s in there. Congratulations! It was not easy, but you did it, and thank you very much for staying with us for a while. We hope that this post provides a quick overview of what Vagrant can bring into your life. Automation can be easy and enjoyable, and we did our best to reduce the complexity of the infrastructure setup while building and open-sourcing the Uplift Project. 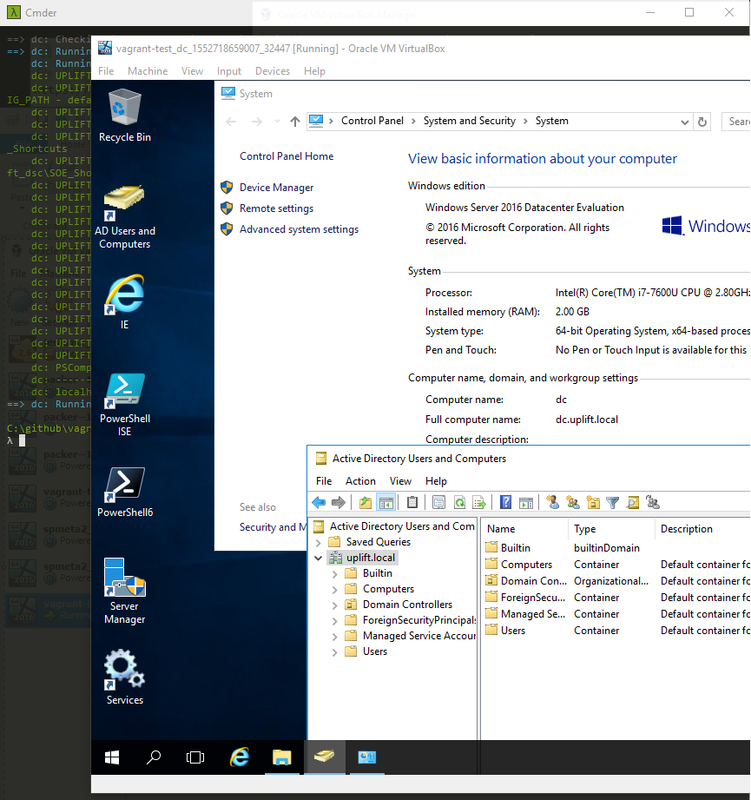 You can destroy and recreate the domain controller again! .. and many other scenarios are also possible, just keep building! If you like what we did, feel free to share feedback and improvements in the comments, follow us here or on Twitter and feel free to share this post too.